Do your days ever feel SO busy and chaotic they just seem to run together from one to the next? A permanent state of shuffling, shifting and stress? My husband travels during the week. Which means more often than not, I am waking up at 5am, attempting to “work from home” while solo parenting three kids and finishing my “days” well after midnight. In fact, my days have been a bit of a blur lately and I can feel the round-the-clock pace starting to take its toll on me. I was determined I could get it all done and then some. Ha, little did I know. I was late for my first appointment, which would also make me behind for my second when I realized I was almost out of gas. I pulled over quickly, pre-paid at the pump and started in on myself for procrastinating the day before. I resolved to salvage what precious minutes I could, hopping in my car to make a quick call. I was sure an office visit would be in order, so I was pleasantly surprised when they said they could email us the documents we needed. One item off my list. I had just made back some precious time for myself. I was so excited to be making progress I grabbed my keys, turned the engine and put my SUV in drive. Clearly, I had too many things going on. It was time to slow down, take a few deep breaths and simplify. To make something simpler, easier to do or understand. 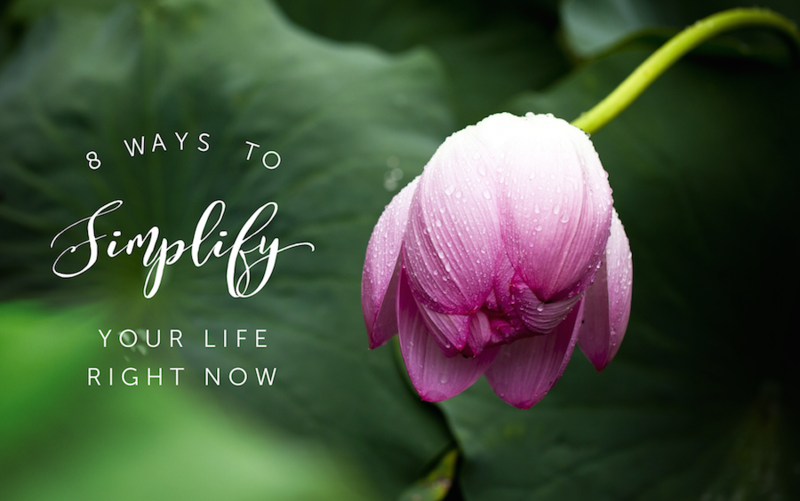 With busy schedules, social media and never-ending to-do lists, it’s nice to think about slowing down and simplifying just a little to connect more with our family, friends and especially ourselves. So how do you do that when you’re surrounded by chaos and overload? I’m glad you asked. 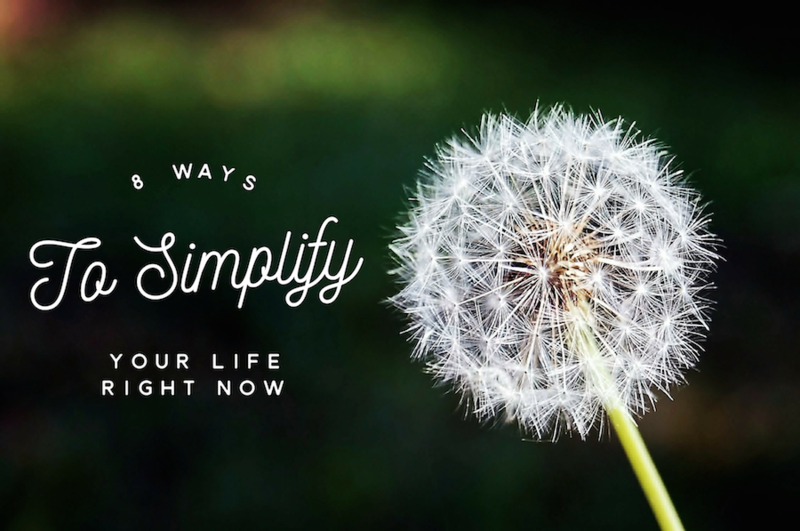 Here are ten great ways to help you slow down and simplify your life. 1. Learn to say “no”. I put this one first because this is so hard for me! We want to help everyone and be a people pleaser, which isn’t always a bad thing, but saying “yes” too often leads to overwhelm and stress. Trust me! Instead, try a different approach. When someone asks something of you that could take a considerable amount of time and effort on your part say “Let me think about it and get back to you”. This allows you to take a step back and decide if this is something you really want to take on. 2. Reduce Clutter. Have you ever noticed that it’s hard to focus on something if you’re surrounded by clutter and things that need to be picked up? [Raises both hands] Our eyes take in everything around us and our brain attempts to processes it all, even if you’re not aware of it. So when you’re trying to focus in a space that has lots of clutter, your brain is overwhelmed with what needs to get done. Try taking a few minutes to just pick up around you. Put the dishes in the dishwasher; pick up toys that are lying around. Make a game of it with your kids. Not only will it help them feel more focused, it will teach them the importance of cleaning up after themselves. 3. Less Multi-Tasking. Multi-tasking leads to overwhelm. Don’t be like me, try keeping a notepad in common areas of your house, in your car and in your office. Make to-do lists including small tasks. This way you won’t forget anything, the task still gets done and you feel accomplished when crossing something off the list. 4. Eat Healthier. Let’s face it, we’re busy people. Always on the go. And sometimes we just grab for the closest thing to eat, no matter how healthy it is. But think of your body and brain as a beautiful flowering plant. Your body is the soil and your brain is the flower. What you feed the soil eventually determines if the flower will thrive or suffer. If you’re feeling stressed and overwhelmed, chances are your diet has something to do with it. Try creating a meal plan for the week. And a snack plan for healthy snacks to have available. I love apples, carrot sticks and celery, and nuts with dried fruit and cheese. I always have them around. I pre-cut the carrots and celery and mix the nuts and dried fruit together and keep them in a large wide-mouthed mason jar, and this lid makes it so easy! Then when I need a quick snack I can just grab them along with a piece of cheese. I don’t even have to think about it. 5. Less Comparing = More Contentment. Comparison is an ugly monster that can drive us to distraction. It makes us miserable and unhappy. Find contentment in your own life and your surroundings. If there’s something you’re not happy with, work towards changing it. But stop comparing yourself to others; it leads to nothing but unhappiness. 6. Save More. Stop being an impulse buyer. Instead, purchase only what is a priority in your life and save the rest to help you live a better life down the road. Give up one cup of coffee house coffee a week and put the money aside in a jar. You’ll be surprised how fast it adds up. Here’s a quick savings trick a friend just taught me . . . After each trip to the grocery store, look to see how much your rewards card and coupons saved you. Sometimes just a few dollars, other times it could be as much as $20 or more. Whatever the total is, round the savings up to the next dollar and put that money aside in a special place. Then use it to do your Christmas shopping. It may be just a few dollars a week, but it adds up to several hundred dollars over the course of the year and you can shop without accumulating any debt over the holidays. 7. Create Routines. When we’re overwhelmed with everything that needs to get done, we start to feel out of control. Put yourself back in the driver’s seat by creating a regular routine for things that have to get done daily or weekly. Choose a day or two every week that you always do laundry, create a bed time routine for your kids to help them get to bed on time and schedule time for yourself to unwind so you can release the chaos and feel calm. 8. Less Technology. Between tablets, smartphones and computers, you could be “plugged in” all day long without even realizing it. Try tracking the amount of time your online from one device to another throughout the day, chances are you will surprise yourself. Once you’ve figured out your biggest time and sanity wasters, set limits on how long you’ll be online each day. Always unplug during quality family time, especially dinner and have real face-to-face conversations instead. Plan a game day or family movie night, no phones allowed, to reconnect with each other. 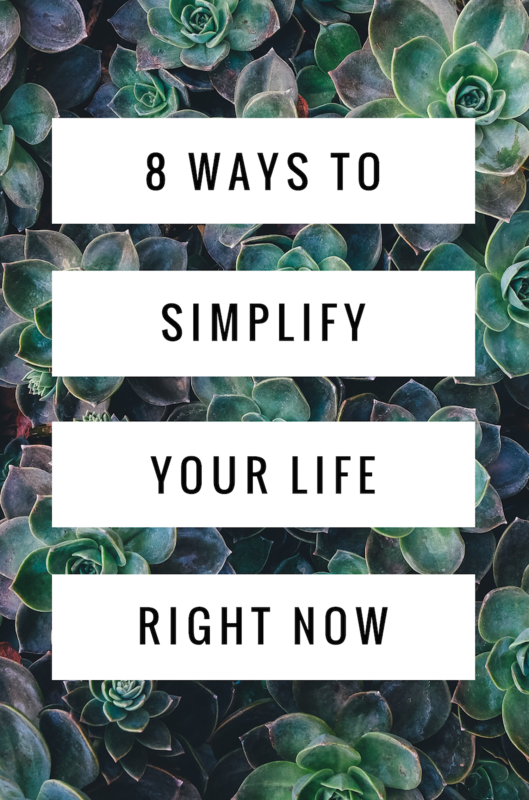 I probably can’t help you make your to do list smaller, your schedule any less crowded, or your days less busy but hopefully with these simple tips you can slow down for a few minutes each day, simplify, reconnect with yourself and your family and feel a little less overwhelmed. I wouldn’t want you driving off from any gas stations mid-pump. Busy moms have got to look out for each other!